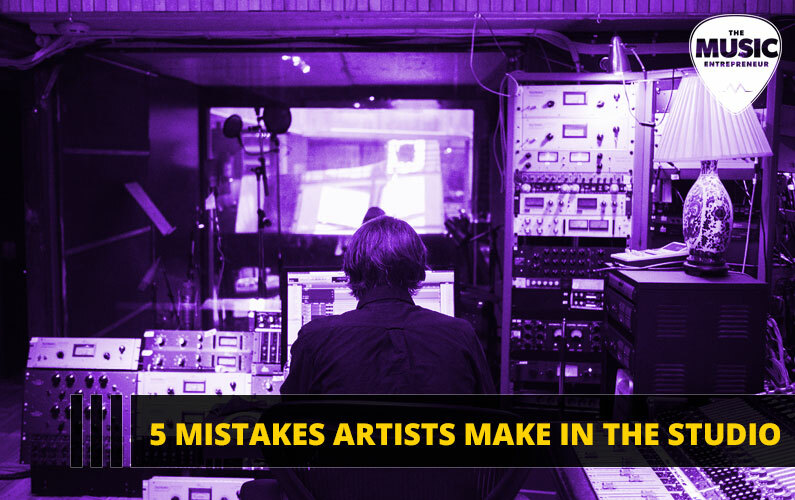 T. Perry Bowers is back with another great guest post, this time on mistakes you should avoid making in the recording studio. If you feel you have something worth contributing to the community, feel free to scan our guest post guidelines here. Now, let’s discover what Perry has to say about what and what not to do in the studio! Most recording sessions go well. Once in a while they crash and burn. Usually it’s not the studio’s fault. The artist carries the biggest burden of a poor recording session. It’s their music. Nobody cares where the record was made. They’ll listen to the music (particularly the vocal) and immediately pass judgment on it. It may sound cliché, but it happens all the time! An artist comes in with no idea what they are about to do. It’s common with rappers. They’ll come in and write their lyrics in the studio, all while paying $50 per hour. Sure, I’ll take their money, but an artist like that is only good for a session or two. They’ll get frustrated with how little they achieve in the studio and burn out. One exception to the rule may be guitar solos. I’ve seen beautiful guitar solos get crafted in the studio on the spot. However, I’ve also seen guitar players get frustrated and nervous trying to improvise. You need to know what kind of a musician you are. Are you spontaneous and in the moment or are you deliberate and intentional? The most important thing is to prepare your state of mind for the studio. I meditate every day, twice a day. While meditation may not be your thing, implementing some sort of ritual into your day helps get you into the right state of mind for recording. For you it might be exercise or maybe just sitting in a coffee shop for 10 minutes without looking at your phone. I use visualization so much that I don’t even realize I’m doing it. I’ll just be daydreaming of the session and see myself nailing all the parts. Visualization will backfire on you if it’s not positive though. Once I had to audition for a band and I was so anxious that all I could see was it crashing and burning. When I finally did the audition, I was too stiff and it didn’t go well. Needless to say, I didn’t get the gig. Your mind is powerful. Make sure you thoughts about recording are positive. Some bands can get away with this. The Rolling Stones had unlimited budgets. Jim Morrison had talent that oozed out of him – sober or high. But most of us are pathetic when we’re drunk. You’ve saved long and hard for this recording session, so make the most out of it. Playing drunk or high is sloppy. Recording sessions can be long. You’ll need sustained energy. Have teas, juice and water in the studio. Have a beer when you’ve wrapped for the day. Or skip the beer if you’re coming in the next day too. You need to be fresh and give your all to your recording. Influence your band mates to do the same. Pizza is the number one studio food. I love a good pizza, but I also like to stay awake for my recording sessions. Pizza and other fast foods make most people sleepy and grumpy. Think ahead about food that will give you energy. Good nutrition to keep your body and brain sustained and hydrated will be a valuable asset in the studio. The way you feel during your takes will be reflected in the sound. Remember you all have to share the studio bathroom for a couple of days too, so try not to make a nuclear wasteland of it. This depends on where you are in the music business. If you’re recording a massive record for a huge label and your worldwide reputation is at stake (you’re probably not reading this anyway) then you may have some reason for being a massive prick. But if you’re making a local record for yourself and your 20 YouTube followers, you need to settle down a little bit. Listen to the advice of the studio engineer. You may be a star one day, but for now, you’re just you. The way you treat people on your way to the top matters – because these are the people who can help you get there. So have fun and keep your ego in check. Bonus Tip: Don’t Distract the Engineer! I’ve been in many sessions where the whole band is talking in the control room while the engineer and another musician are trying to get a take. Sometimes the engineer is mixing a song while the whole band is having a party. He might not say anything, but you can be sure he is annoyed as hell. So keep talking to a minimum in the control room when recording is happening. When it’s your turn to record, you’ll appreciate it.